During 1995, production of the M1114 based on the improved ECV chassis began. The M1114 meets Army requirements for a scout, military police, and explosive ordnance disposal vehicle with improved ballistic protection levels. The M1114 provides protection against 7.62 mm armor-piercing projectiles, 155 mm artillery air bursts and 12 lb (5.4 kg). anti-tank mine blasts. 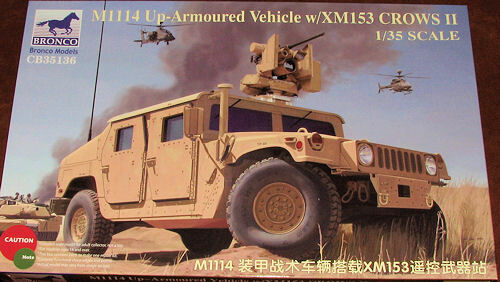 The U.S. Air Force has a number of vehicles under the designation M1116, specifically designed to meet the requirements of the Air Force. The M1116 features an expanded cargo area, armored housing for the turret gunner and increased interior heating and air conditioning system.The M1114 and M1116 receive armor at O'Gara-Hess & Eisenhardt Armoring Company of Fairfield, Ohio. Many have been fitted with CROWS. The Common Remotely Operated Weapon Station program, (CROWS or CROWS II) is a remote weapon station that provides the operator with the ability to acquire and engage targets while inside a vehicle, protected by its armor. It is designed to mount on a variety of vehicle platforms and supports the MK19 Grenade Machine Gun, .50 Caliber M2 Machine Gun, M240B Machine Gun, and M249 Squad Automatic Weapon. Nice thing about this vehicle is that there are a ton of different variants. The reference shows at least a couple of dozen and this is one of the newer ones. In order to not expose a gunner to fire, this remote gun was developed. Now how well it works I do not know, but it certainly looks neat and gets rid of the rather heavy upper turret. 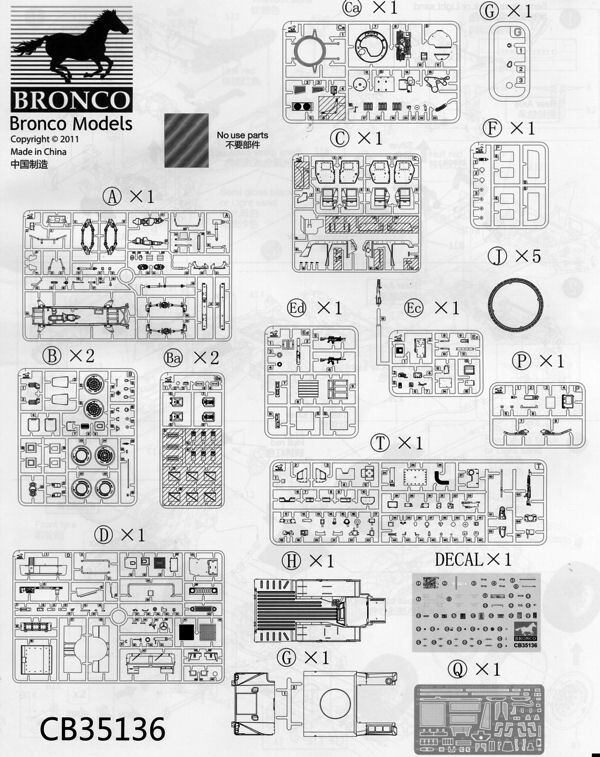 All of Bronco's kits are for an experienced modeler and this one is no exception as the detail provided is first rate. Despite being something of a curbside (as in no engine), just about every other part of the vehicle is provided and in quite some detail. The chassis is a separate piece that, once the suspension is attached, will fit onto the bottom of the main body piece. As a note, this body piece and the tire treads are boxed separately within the kit's package to to prevent damage. A full interior and cargo area are provided with no detail missed. 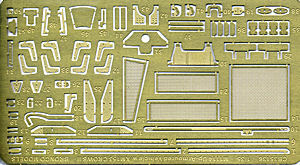 There are plenty of placards that, like the instruments, are reproduced on the decal sheet. You expect photo etch with a Bronco vehicle kit and you very much get that. It is not an overwhelming amount and is appropriate for the purpose. For instance, all the grilles on the front and hood of the vehicle are in photo etch. Several brackets and handles are also reproduced in etched brass as are trim strips on the inside of the cargo area. Some are required for the XM 153 system. The use of these parts is clearly shown in the instructions. Another item clearly shown is when bolt heads are to be used. Rather than run a molding seam through bolt detail. Bronco molds these items on the sprues. One then cuts them away and places them where they are needed. Seems to work well and certainly is easier than trying to clean these things up. In addition to the vehicle, Bronco provides a bunch of bits to use as cargo or to place within the vehicle as the builder might want. This includes a military radio group, jerry cans, combat ID panels, Digital command system, ammo boxes, and various weapons, just to name a few. The instructions are in color and first rate with not only color information supplied where needed, but also the use of a specific color for the photo etch bits and pieces. The 31 construction steps are clearly drawn with additional info drawings where part placement might be an issue. The small decal sheet is pretty much stencils and placards. 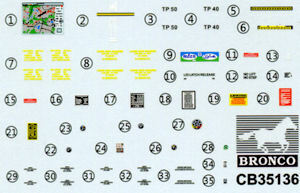 No specific unit is provided for the single color option; that being an overall desert tan vehicle. If you are up to the task of all this detail and want a superlative representation of this vehicle, then this is the kit for you. It will not be a quick build, but it will be a beauty when you are finished.